2019 signifies the 200th anniversary of the start of British colonial rule in Singapore. Many historians associate 2019 to be the founding of modern Singapore. When it comes to Singapore’s founding, one name above all stands out – Sir Stamford Raffles. Idolized and mystified, his name is embellished on prominent institutions, hotels, roads, shopping malls, MRT stations, and hospitals. Every Singaporean student who remembers his/her social studies lessons will remember that it was Raffles that founded and laid the foundations of modern Singapore. But in recent years, more historians have been drawing attention to the actual role Raffles played in Singapore’s early years. Using archival records, they have sought to shed light on the key decisions made in the immediate years following 1819. Their verdict? Major-General William Farquhar did more for the success of Singapore than Sir Stamford Raffles. Ambassador-at-large Tommy Koh made this comment at the launch of the book, 200 Years of Singapore and the United Kingdom, held at the National Museum of Singapore. Ambassador-at-Large Tommy Koh said this at the launch of a book to reflect on the shared history between Singapore and the United Kingdom on Tuesday (Jan 29). The book published by the Straits Times Press features a series of essays by scholars, historians and subject specialists from both Singapore and the UK. “Raffles has been given too much credit and the first two Residents, Farquhar, and John Crawford, too little, for the success of early Singapore”. Raffles departed Singapore a few months after his arrival in 1819 before leaving for his base in Sumatra. He “left Farquhar understaffed, underfunded and under-stocked, having issued hopelessly impractical orders to be carried out in his absence”. Farquhar co-operated closely with the local population, using his rich knowledge of Malay culture and politics. He was pragmatic, even permitting gambling and opium dens to appeal to traders, much to the disdain of Raffles. Although in the ensuing years, Farquhar and Raffles disagreed over the administration of the settlement. Ultimately, differences in opinion led Raffles to successfully campaign for Farquhar’s removal from the island in 1823 and the rest is history. 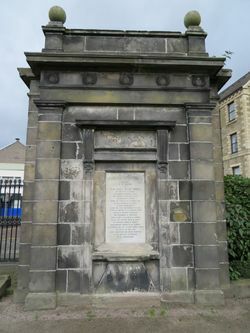 Today, William Farquhar’s grave is in a discreet spot in Greyfriars Kirkyard, Edinburgh, United Kingdom. There no buildings or roads named after Farquhar or memorials to his contributions.